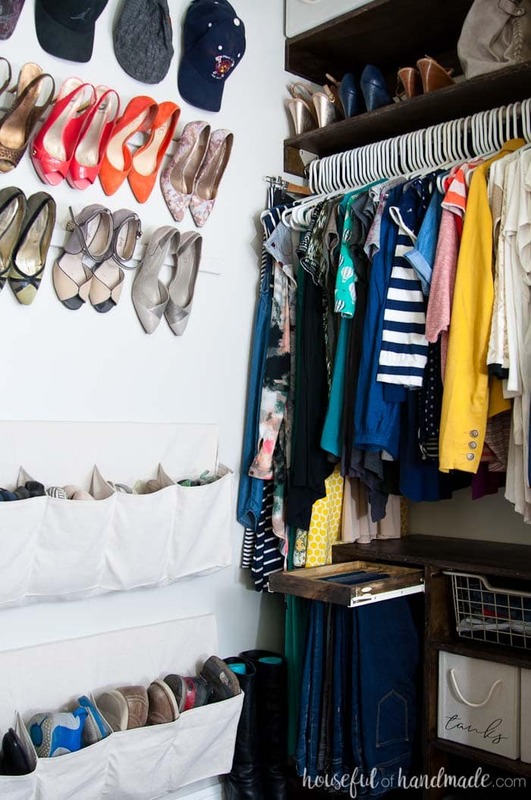 Transform your walk in closet into a beautiful and functional room on a budget. 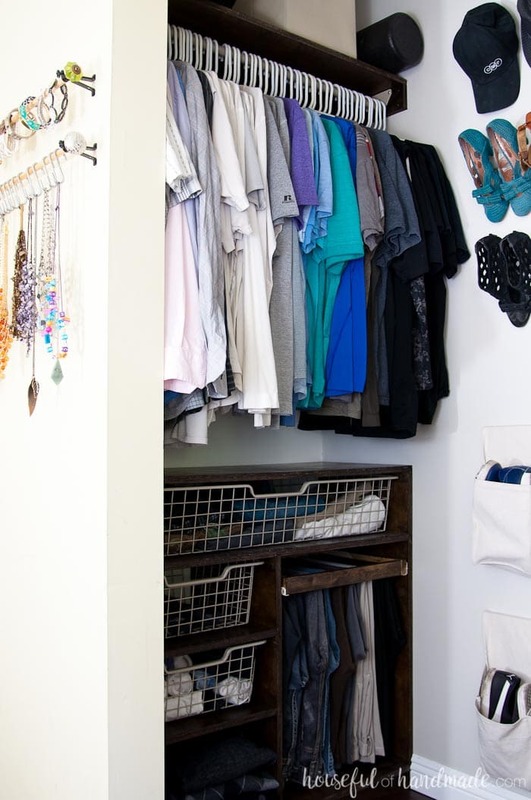 See how we were able to turn our crowded closet into an open dressing area with lots of storage and style. 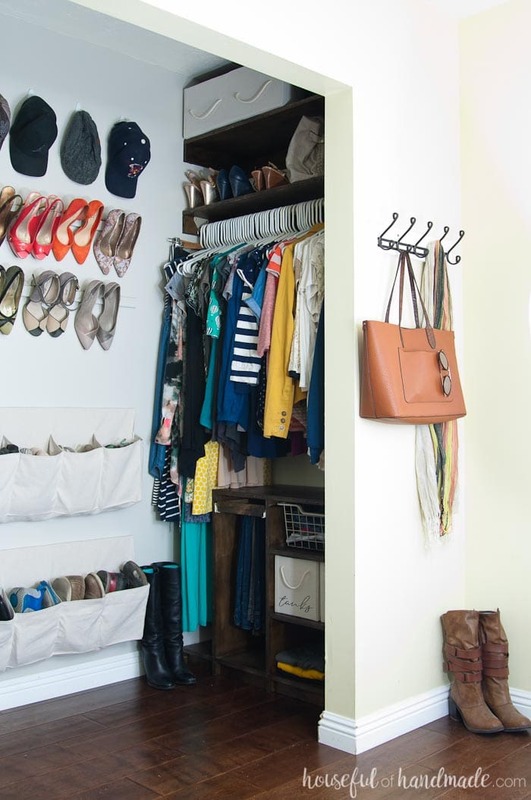 The $100 walk in closet makeover is done! Can you believe we totally transformed the space in just 3 weeks with only $100? I can’t either. But I am so happy we did because I love our new walk in closet. 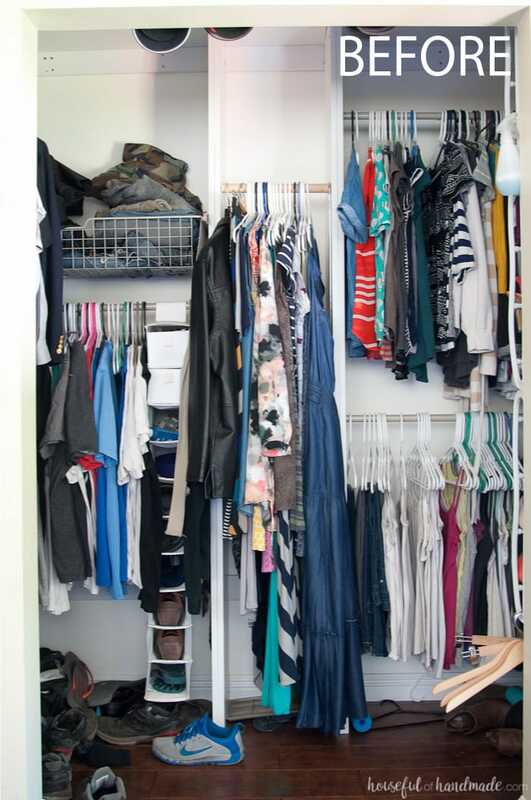 Before, I wouldn’t have even considered it a walk in closet, it was just a deep and cluttered closet. Now it’s an open and very organized walk in closet with room for us to actually change in it. This is exactly what I had hoped for the perfect master bedroom closet. Seriously, do you remember how awful this space looked before? The closet system was along the back wall. We figured it would give us more room and in a closet, you are always worried about more storage. However, we pretty much ignored the storage that was in the corner. It was where our out-of-fashion clothes went to die. Now we have absolutely no hidden corners. Everything is in full view at all times! While we gave up actual hang bar space, I feel like we gained so much more usable storage space instead. The closet is split into a his side and her side. I created two different plywood storage organizers to fit the needs of each of us. The plywood closet organizers (and upper shelves) were built out of 2 sheets of $35 plywood (and a couple dollars in other wood). That is it! All that beautiful storage for less than $80. On my side of the closet, I gave myself room for long dresses and skirts. Then the rest of the hanging space is used for blouses. Below the hang bar is loads of storage for the rest of my clothes. Baskets and boxes hold smaller items. And sweaters are folded on the shelf (no more hanger marks in the sleeves!). Then a roll out pant rack was added for jeans. My absolute favorite part of the walk in closet organization are the boxes that hold my tanks and camisoles. I use to hang all these items. Things that were only used under other clothing or to work in the garage (I am pretty sure all my tanks have paint stains on them). They took up about 25 inches of hanging space to hang them all. Now they don’t even fill these two tiny boxes. And how adorable are these boxes with the rope handles and script labels? I promise to share the tutorial for them soon! On my husband’s side of the closet, I was able to comfortably mount the hang bar higher. He is 6’3″ so we used that to his advantage in the closet. 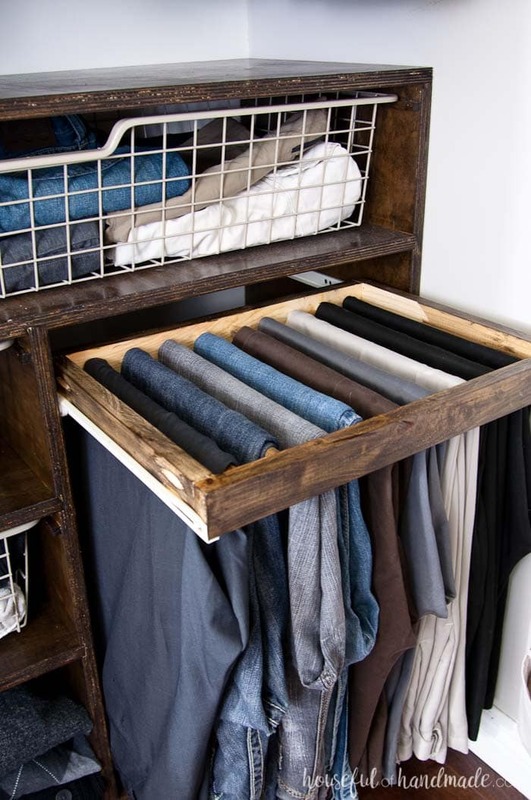 His plywood storage organizer offers lots of storage for all his socks! Seriously, I think socks are a weird boy obsession because both him and my son have way too many and always want more. Then he has a large basket for his shorts and lounge pants. And a much larger pull out pant rack for his dress pants and jeans. And would you believe that we only have 2 inches less of space on each side of the closet? If you removed the center hang bar from our old closet and we each had to work with just the space to either side, it would be 2″ more than what we have now! 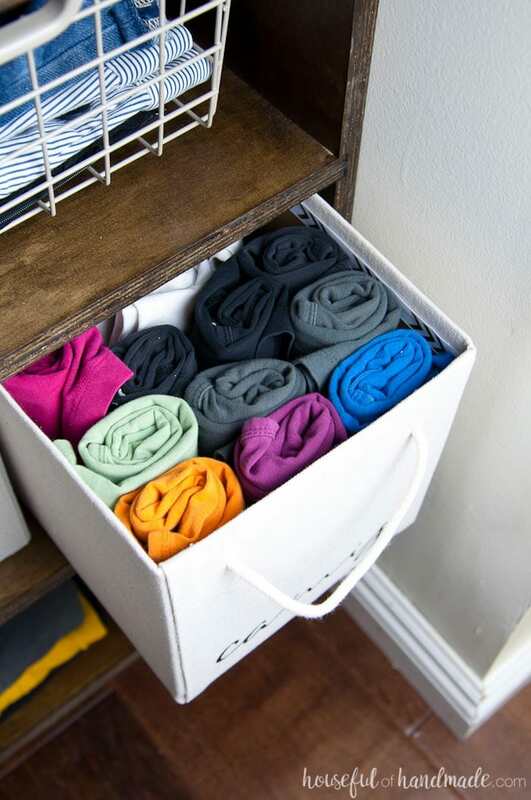 And now we have created storage solutions to hold all our clothes and offer room to grow. I don’t even miss those 2″. After finishing up the walk in closet organization systems, we realized how much we LOVED the open feel of our new closet. We can both be in the closet getting ready and I don’t want to scream! My original plan for shoe storage was to build a shelf with the white laminate covered wood I removed from the closet. But I didn’t want to add a large piece to the space. So we went back to the drawing board. And what we came up with was so much better. Just check out that shoe storage!!! I am slightly obsessed with shoes. I used to have over 100 pairs (I know, excessive). Last year I minimized my show collection because I really wasn’t wearing a lot of them. Now I am super picky about the shoes I buy. Keeping a handful of comfortable, but beautiful, shoes makes it easier to get ready. And now I can actually see them all. 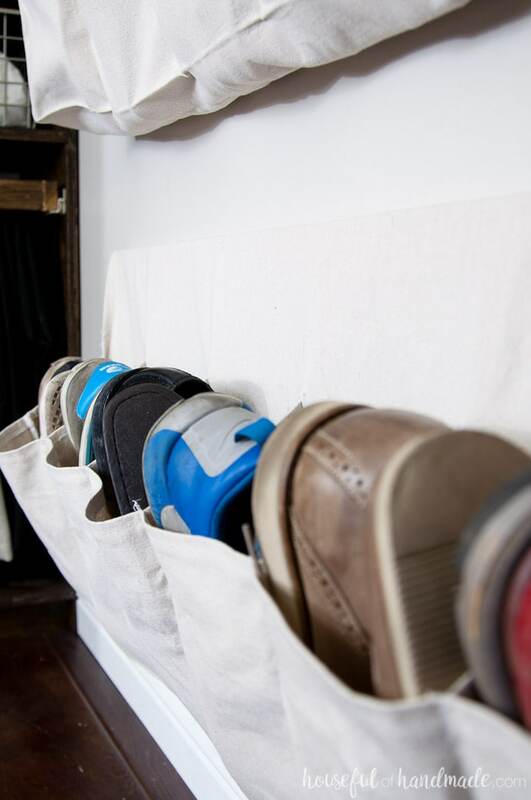 The lower shoe storage is perfect for all my husbands shoes and my non-heeled shoes (aka workout shoes and flip flops). I sewed these shoe pockets out of drop cloth. Each one took about 45 minutes from start to filling-with-shoes. They keep the shoes off the floor but keep them in sight, which I love. Tutorial coming soon! But the upper shoe storage is my favorite! And it couldn’t have been easier. 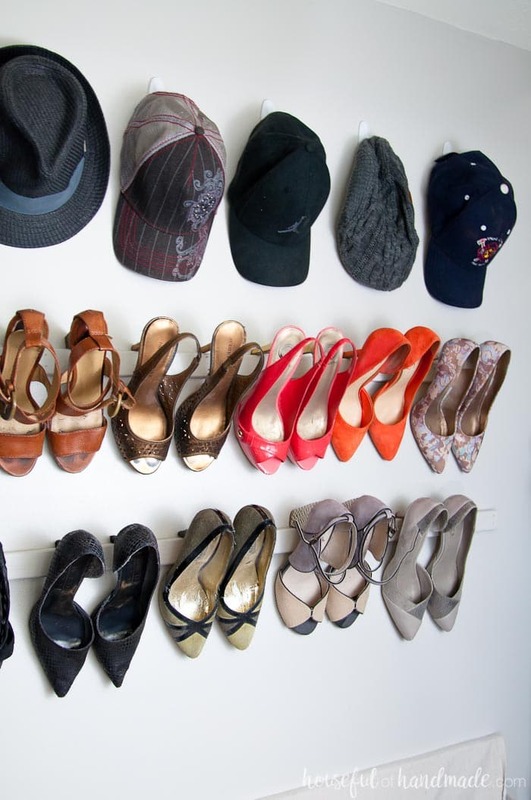 I have seen heel storage using crown molding, which is beautiful. But crown molding is expensive. At $2-5 a linear foot, the small shoe storage area that I have would have cost up to $40. Instead, I discovered that the heels rest just as beautifully on a 1×2 furring strip as they do on crown molding. So with 1 8′ furring strip that cost me $1, I mounted that to the wall and painted it so it would blend in. Then covered it with all my glorious shoes. Yep $1 total, now I have money for new shoes. To hang my husband’s hat collection, I added some white Command hooks. 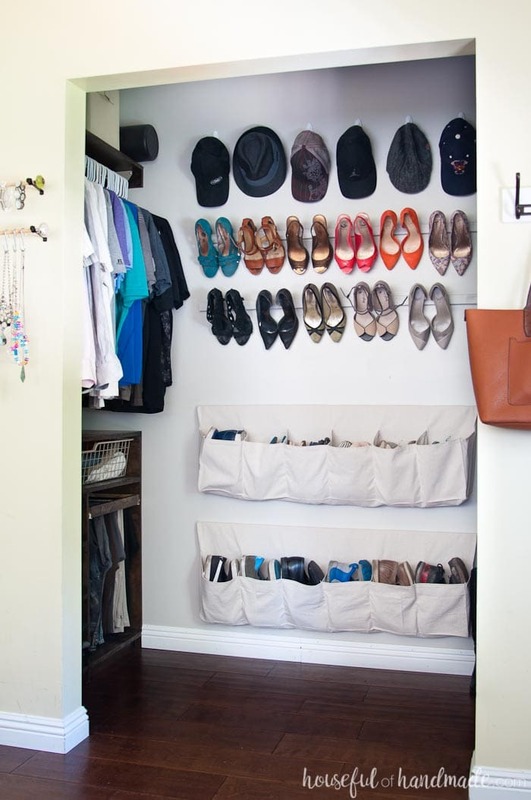 This is the easiest hat storage and I love the way it looks to have the masculine and feminine on the wall together. See, we can share closet space and still love each other! And while I was certain I was going to blow the budget away after 1 week, I managed to get super creative and make it work. Total for the amazing walk in closet transformation: $102!!!! So did we completely transform our walk in closet? I would say so. 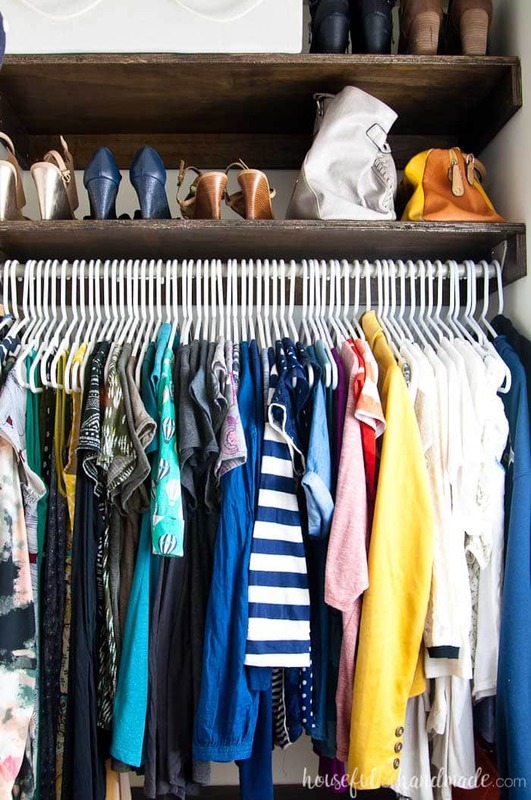 The new open feel of the closet makes it more like a dressing room instead of just a closet. And it makes our master bedroom feel bigger too. I totally love it! And don’t forget to check out how these other amazing bloggers transformed their spaces for only $100 this month too! Now I need to clean my master bedroom and get my beautiful retreat back. Your use of vertical space is just brilliant! I would love to dress every morning with a closet like that. Beautiful job! Thanks Kathryn! I love it so much and it definitely makes getting ready more fun. This closet is gorgeous! I wouldn’t want to ever rehang my closet door if mine looked like this! (Now I close it just as quick as I can!) That plywood shelving system you created is so impressive! 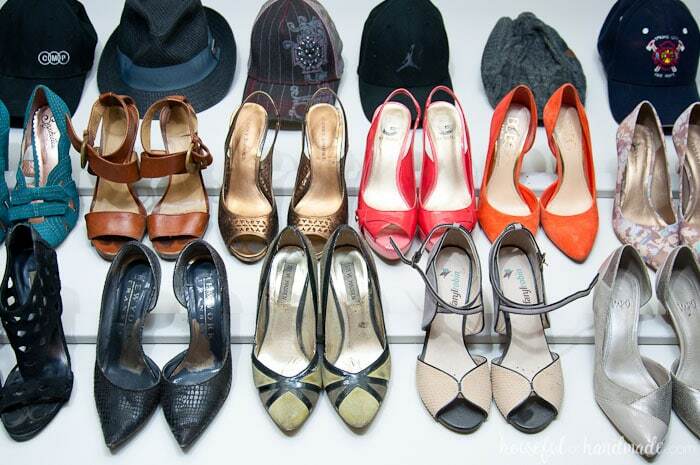 I love how your shoes are stored! Those pops of color are so fun and what a great way to show off your beautiful collection! It must actually be FUN to get ready in the morning! Great job! I’m sure you are LOVING it!! Thank you so much. I don’t even mind that we don’t have a closet door. What a great use of space!! I love how you hung up your shoes. Fabulous idea! The shoe storage is my favorite! Now I can actually see what shoes I have. Hello!!! This is amazing. I can’t believe that you built all of that. It is so so good. I hope to imitate your ideas some day. I love it all so much. Thanks Jessica! It turned out better than I had hoped. And it’s super organized and fabulous! Holy cow, you worked wonders in here! Seriously, this turned out so well! This closet is just the best thing ever! First, the storage you created is amazing. My favorite part is the fabric covered boxes with cute font-lettering and rope handles 🙂 Your shoe storage idea was brilliant… and for $1?! Your $100 Room Challenges seriously blow my mind. Love them! I am SO glad you participated again. Now go relax and enjoy that gorgeous closet! Thanks so much Erin! I absolutely love these challenges because it makes me get super creative and so far creative has been the best ideas. Now I definitely need to relax, and get the rest of the tutorials ready to share! Well now I have serious closet envy! Your built-ins are perfect, and I love how the shoes and hats become a work of art. This must change how you feel every morning when you get dressed. Beautiful job! 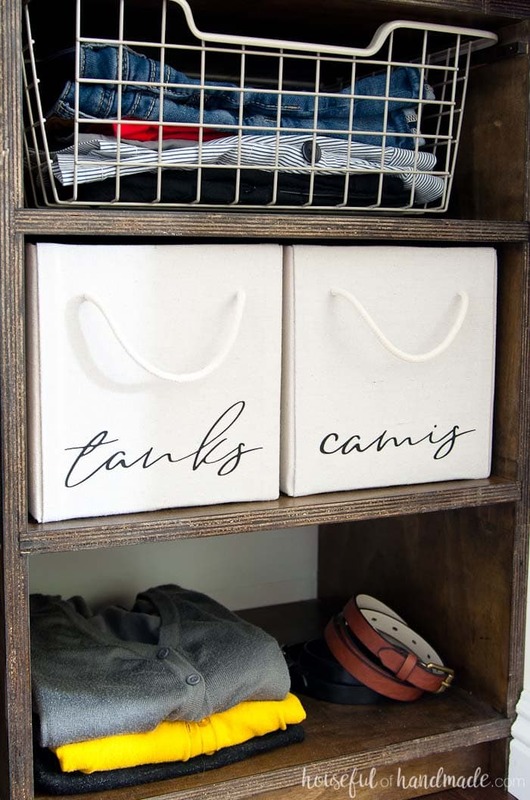 You’ve brought so many fabulous organizational ideas into this small space!! 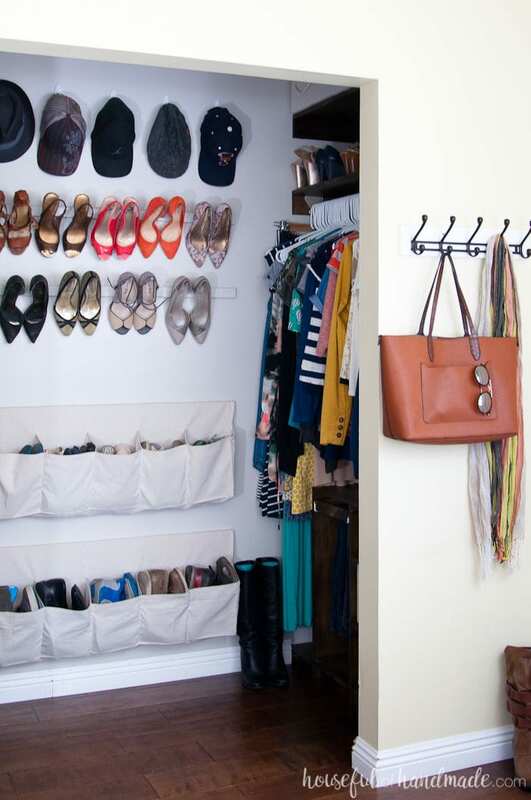 Such a smart move to create the hanging rods and storage shelves on either side of the closet! And, what can I say about that show storage (both the hanging racks and fabric pouches) except GENIUS!! Thanks so much Jenny! I was worried there wouldn’t be enough room moving the storage to the sides, but it was totally worth it! Ummm wow! I want a closet like this! You did a fabulous job with the organizers. And your heels are so pretty! I can’t believe you did this for $100! I am in love with the organizers you created. So useful but so pretty! 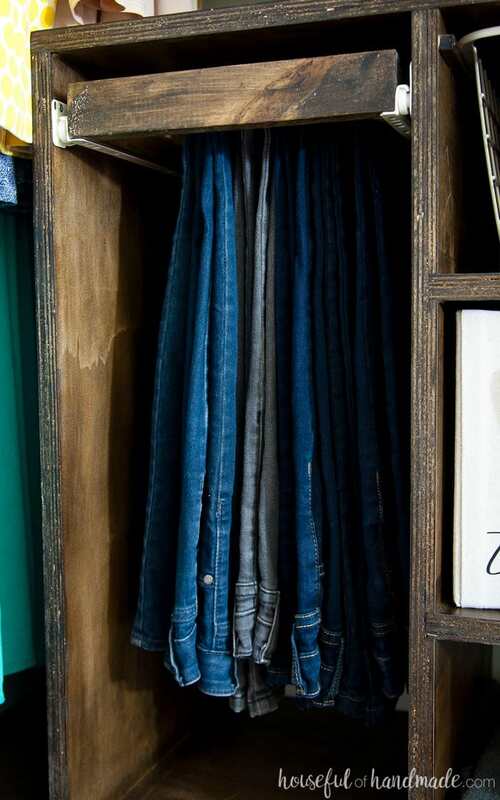 Hanging the jeans from the wooden dowels, perfect!! 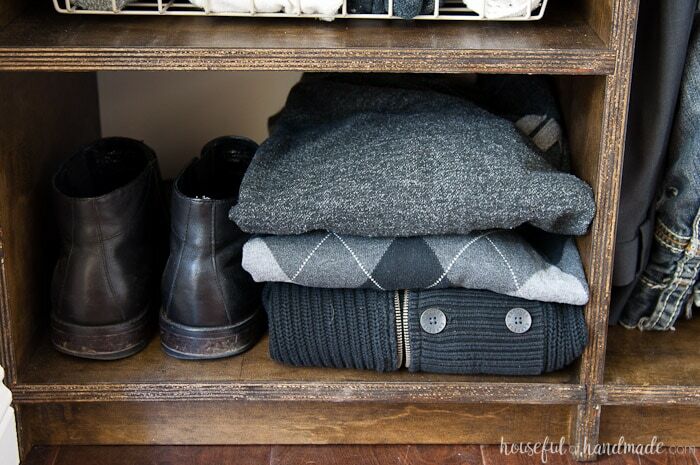 Love the sock organization, and organized shoes, what’s not to like!! Thank you Linda! The pant racks are my fav, I love how they turned out! Absolutely gorgeous! Nice work! 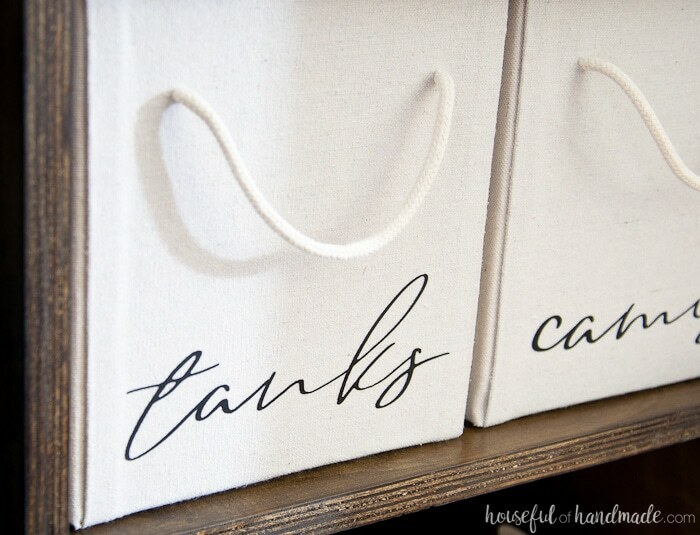 Seriously cannot wait for the tutorial on those script tote boxes… I’m in LOVE! Thanks so much Nicole! I love how the script tote boxes turned out and am working hard to get the tutorial ready for you! 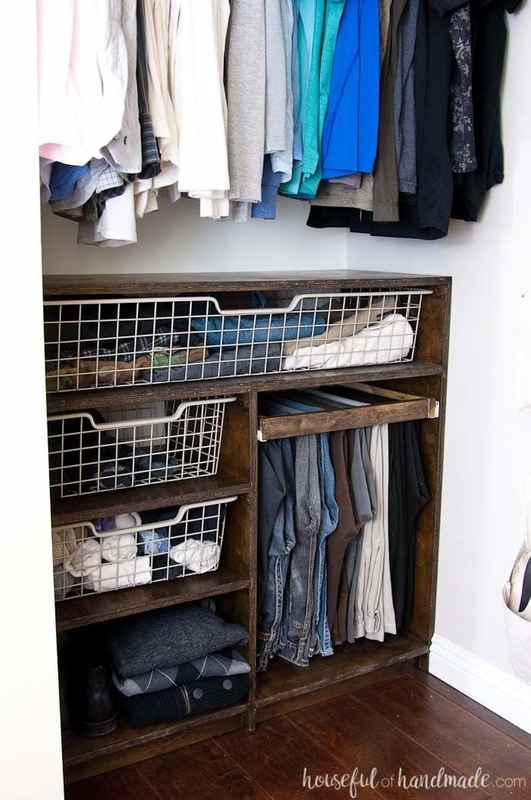 This is such great storage – I love how you guys used the space!! And those bins with the script letters are so cute, can’t wait to see the tutorial! This is very impressive walk in closet. I am very inspired by all the work you did. I have been wanting to create a closet for the room above the garage and I saved this post and the other ones you did as a reference. Thanks so much Maria! I can’t wait to see what you do with your closet. This is great! You definitely made every cent count. I love the plywood storage and especially the pant hanging method. That upper shoe storage trick I recently added to my parent’s closet since they had an extra piece of crown moulding laying around, they loved it as well. Thanks Tammy! I love shoe storage, and it was so easy!